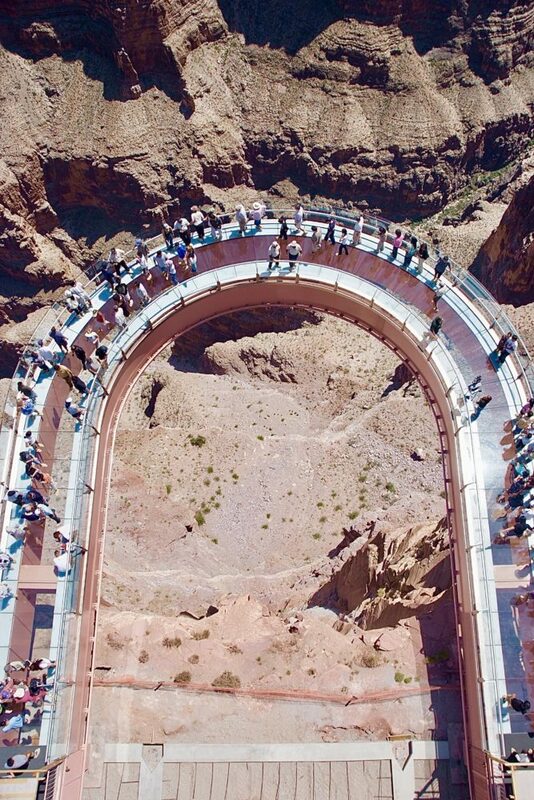 4,000 feet above the bottom of the Grand Canyon, a horseshoe-shaped glass bridge takes you to the realm of weightlessness. Furthermore, it makes you feel like an eagle that spreads his strong wings and majestically soars above one of the 7 Natural Wonders of the World. 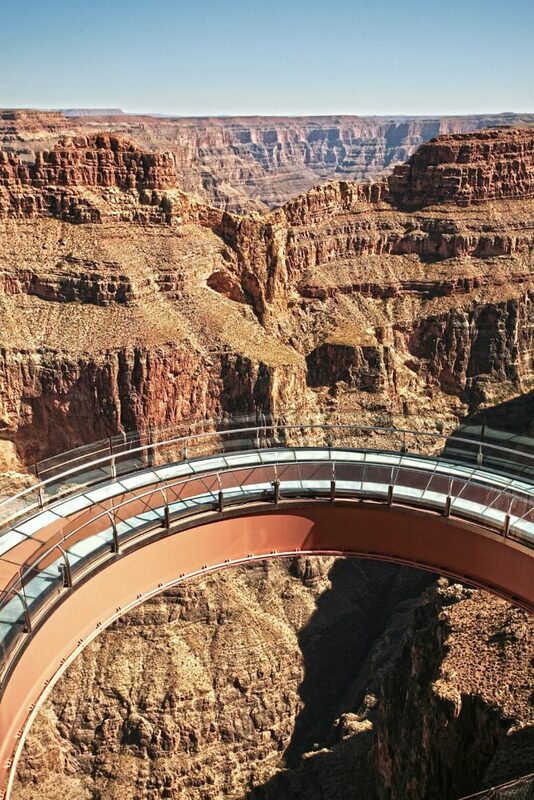 Like the Canyon, the glass bridge is nothing short of the world’s wonder. 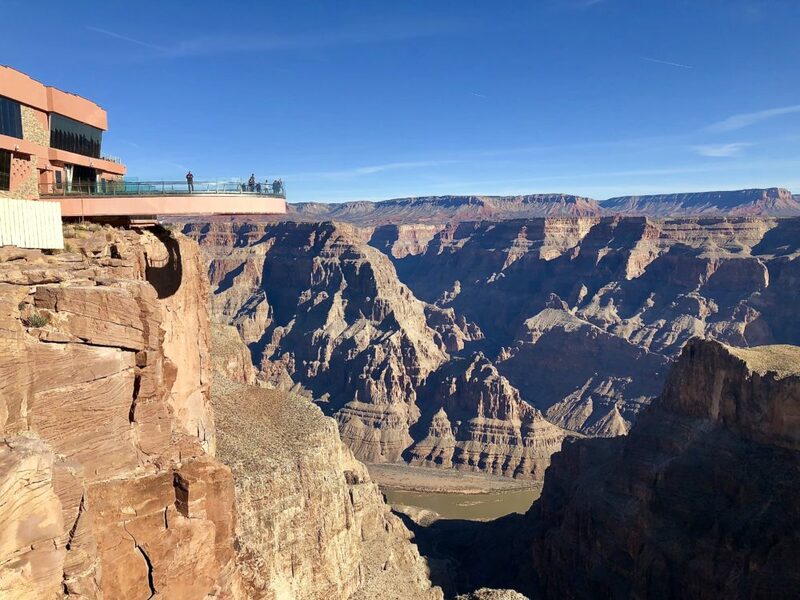 Opened in 2007, the 10-foot-wide Skywalk extends 70 feet out over the edge of the Grand Canyon and is capable to hold weight of seventy 747 passenger jets. Bearing this in mind, you do not need to worry about walking on the glass surface towering over one of the deepest canyons in the world. But let us be honest, you might completely forget all these impressive facts as soon as you put your feet on the bridge. Your fear and uneasiness might last just a few seconds or minutes. In worth case scenario, some visitor might force you to cross to the opposite rim of the structure. It is not hard to recognize this type of adventures right away. This are the people who fearfully grasp one rim of the bridge and slowly proceed toward the middle. 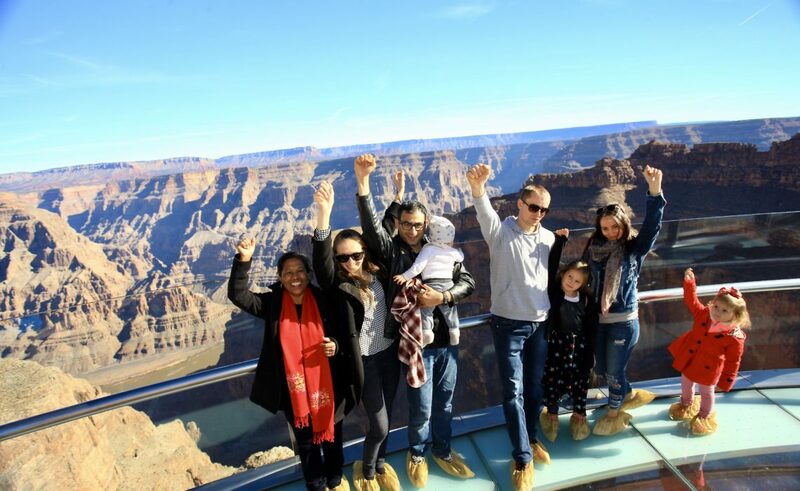 A few minutes later, they finally exit the glass miracle at the Eagle Point of the Grand Canyon. The thrilling Skywalk experience comes in a package. 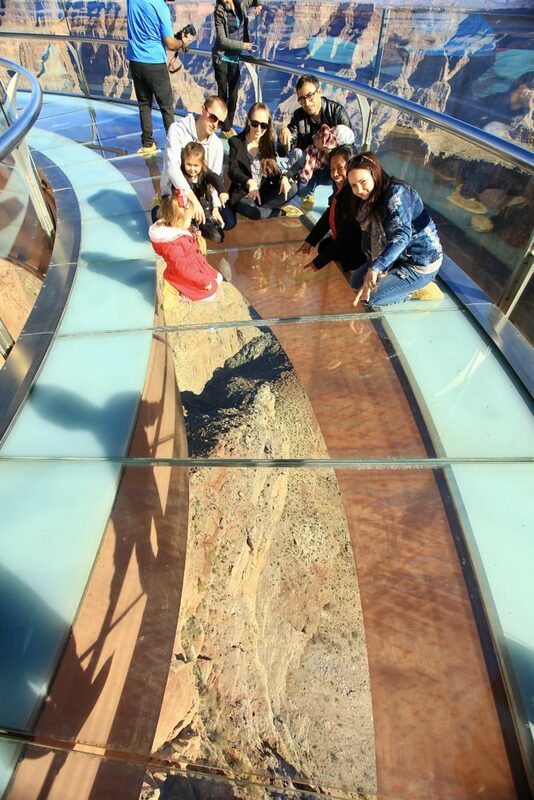 While you might enjoy the west side of the Grand Canyon by purchasing less expensive tours, only the Legacy Gold Package ensures your entrance to the glass bridge. Besides admission to Hualapai tribal lands, for about $83 you get to appreciate the convenience of hop-on-hop-off shuttle to 3 main viewpoints. Here you will have the opportunity to take pictures with Hualapai members. If you are hungry, make a stop at a small cafe/restaurant at one viewpoint of your choice. And above all, enjoy the highlight of the tour – the walk on the crystal clear bridge over the deep chasm. To avoid any accidental drops of personal items in the canyon or on the bridge, you will need to leave all personal belongings in locker rooms before entering the bridge. Unfortunately for both skilled photographers and amateurs, all cameras and camera gears go in that safety deposit box as well. Any kind of photography on the Skywalk is strictly prohibited. This rule even applies to always handy iPhones and smart phones. Despite the strict regulations, in no way, you will be left without photo memories of this incredible adventure. Combining your preferences with their professional skills, a few professional photographers will gladly accommodate you with capturing the Skywalk experience. By now, they know exactly how to provide you with the pictures that can easily pass Instagram’s high standards. Even if you try to stay on budget, take advantage of this opportunity and make sure to ask to take as many pictures of you as you only wish. Here’s why? After taking a quick glance at your pictures at a gift shop located near the exit of the bridge, you have two options. First, all visitors can purchase single printed pictures for approximately $16 apiece. Second, all your pictures get stored on a USB flash drive (the price of the USB flash drive is included in the total amount) together with bonus pack of 20 pictures of the Skywalk for a little bit over $65. Not a big price for such a worthy experience! Someday sitting cozily at your house with a cup of hot tea or coffee you will enjoy going through these pictures and reliving your Skywalk adventure over and over again. Still fired up by the images of deep abyss underneath my feet, I wanted to conclude this blog post by saying that everyone at least once a life have to walk on the glass bridge at Eagle Point. As soon as I started typing these words, my mom and her fear of height came to my mind. After pausing for a few seconds, I had to admit that with all its uniqueness and adrenaline rush the Skywalk is not for everybody. However, if you are one of those people who prefer to keep their feet on the solid ground, nothing can prevent you from admiring the Eagle Point and marvel at the glass bridge from the distance. Woah this skywalk adventure sounds amazing. It’s such a shame not to be able to take your own camera but at least there are professionals there to get pictures for you. I’d love to visit this place sometime! Yes, having our own cameras there is definitely better. But you cannot do anything but comply with such strict regulations. What an exhilarating experience! The photos are awesome, so clear and sharp. Thanks for sharing this dear, wish I had a chance to see the Grand Canyon. I’ve always wanted to do this! I think it looks like such a fun experience. I definitely get why they make you leave all of your stuff in the lockers, but that’s still a bummer that you can’t take your own photos. But still, I agree that this is a must do, at least once! Wow what an experience! I was at the grand canyon years ago and have been wanting to go back for some time. This looks like fun =o) Although it’s a shame you can’t bring your camera with you, but I understand due to safety reasons. If you want to go back, than you should for sure. Even if your day job doesn’t give time for your mini-vacation, a weekend getaway will be more sufficient for this trip.